In this analysis the performance of PMR446 (446 MHz) and LPD (433 MHz) is compared to demonstrate the performance to its potential users. PMR446 is a type of radio that is free usable in Europe where it is using 8 channels in a 6,25 KHz raster in the 446 MHz band using a permanently attached antenna. The maximum power is 500 mW Erp. In the USA there is a very similar service called FRS. It is using hand-held radios with 1/2 watt ERP, permanently attached antennas, and requires no license. It has 14 channels in the 462 and 467 MHz range. Permanently attached antennas are also used with LPD (Low Power Devices). However these LPD devices have a maximum power of 100 mW and use 69 channels in the 433 MHz band. Single polar Radio coverage, where the plot is using; Contour line, Fill Area, and a treshold set at the minimum Rx level. Draw rings, with a interval of 500 meters where the colour of the rings is black and the labels are white. Radials are not used. 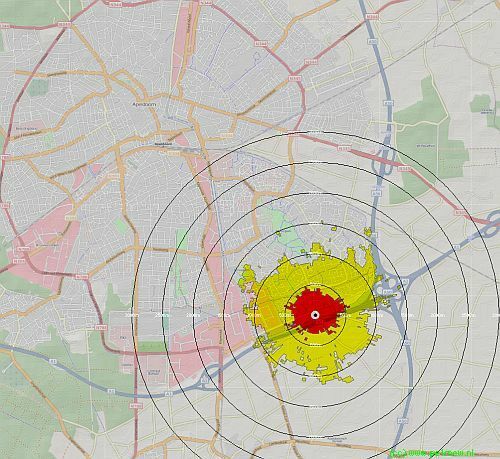 The coverage is plotted on a Openstreetmap raster. Compared coverage at ground level. For this analysis the radios for TX and RX are at 1,5 meter height. The antenna gain of the radio's is estimated at -3 dB. The boundary is set to -115 dBm minimum RX level. 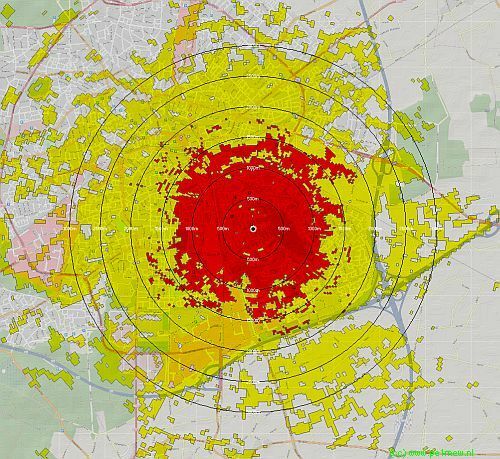 Red is the estimated radio coverage of the LPD radio's and Yellow is the estimated coverage of the PMR 446 radio's. Compared coverage from a top of a building (45 meters). For this analysis the radios for TX are at 45 meter height and the RX radios are at 1,5 meters..